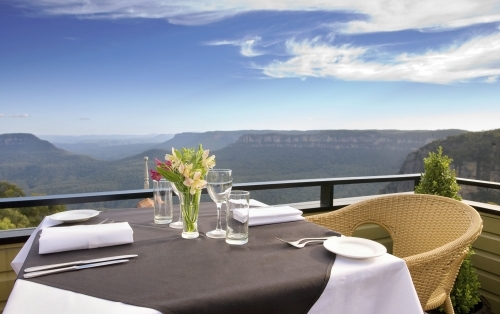 Echoes Boutique Hotel and Restaurant Katoomba is perched at the very edge of the Jamison Valley at Echo Point in the Blue Mountains. Our unique location offers stunning and uninterrupted panoramas of the National Park from every room, providing all our guests with ever-changing but always dramatic and breathtaking views. Our award winning eclectically designed building has 12 Deluxe View rooms and 2 Corner View suites - all with en-suites, contemporary & stylish furnishings, generous indoor and outdoor seating areas to allow guests to soak in the views as well as the lush cool air of the rainforest valleys below. There are open fire places throughout the Hotel, an ambient bar/lounge as well as a private spa and sauna offering an array of soothing treatments. Echoes' Restaurant is set against the magnificent backdrop of Echo Point in the Blue Mountains with incomparable views of the Jamison Valley, surrounding cliff drops and lush rainforest valleys stretching all the way to the Mittagong, 80 kms away. The fresh air, miriad sounds of the bush and marvellous views are a feast for your senses whilst delighting in our creative cuisine and carefully selected high quality boutique Australian wines. Our unique combination of fine dining and luxury accommodation will provide that memorable difference to any occasion whether a romantic dinner for two, a leisurely lunch with a business client, a Conference venue with an edge or a stunning Wedding reception to remember.. All this and only 90 minutes from Sydney!